I have never seen these chocolate candies before our trip back to PA. These were the treats that were being given out after our visit to Hershey's Chocolate World. The boys do not like nuts, caramel or peanut butter, please tell me what is wrong with them. It was hard to keep one until we arrived back home but some how I managed. As you can see from above there is a nice size pocket of caramel at the top, peanut butter in the middle and a mix of nuts (pecans & peanuts) on the bottom. 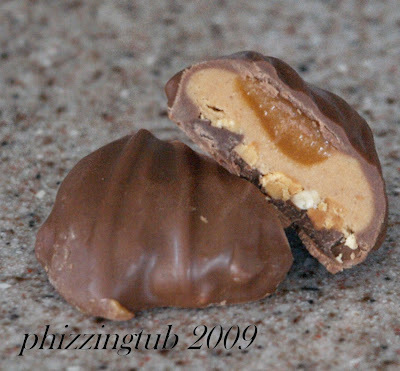 The candy was not overly sweet and had the right amount of caramel and peanut butter. 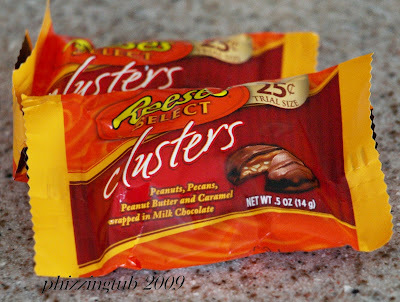 Personally, it could have had a few more nut pieces but overall they added a nice crunch & texture to the candy. I did enjoy the bar, I mean it has majority of my favorites wrapped into one. I will have to keep my eyes opened for them around here and will treat myself every so often to one. If you want to read a different review of them, check out Sugarhog.net.